The organizers of “Sharing the Stage,” a concert series that pairs performances by well-known music acts with those by local teens, will pull off another musical coup these weekend when they bring the hip-hop duo Blue Scholars to Vashon. 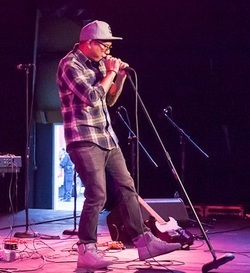 Blue Scholars may be the most well-known group yet for “Sharing the Stage,” a series that has also brought such Seattle luminaries as rappers Macklemore and Ryan Lewis, trumpeter Thomas Marriott and the band Visqueen to the Island. The series is organized by Vashon High School teacher Harris Levinson along with Rob Bordner and Fred Strong. Both Bordner and Strong are parents of students who either currently attend or have graduated from VHS. Vashon Island Music has also signed on as a co-producer for the Blue Scholars show. But according to Strong, local teens have been more involved than ever before in organizing this particular show. Strong gave credit to two students, Anya Quig and Sequoia Perpetua-Lowry, for initially making contact with the Blue Scholars’ manager to ask if the duo would be interested in performing here. Blue Scholars seem like a perfect fit for the concert series. For their show on Vashon, they’ll share the stage with opening acts by local teens — rapper Pete Evans, the band Blueberry Frousting and freshmen Cameron Sonju and Quipachtli Martinez. And for the first time ever, spoken word performances by teen poets — Anna Rose Warren, Zauxie Sackman and Danny Rosenberg — will also be woven into the opening acts. Some of the students have been coached by Ian Moore, a singer/songwriter and much-lauded guitar player who lives on Vashon. And Strong said he was also thrilled to hear some of the teen performers urging another to seek out musical advice from Maggie Laird, an Island singer who is also a VHS parent. “We’re creating an orbit of mentorships that we couldn’t have predicted, but it is what we hoped would happen,” he said. The concerts are a financial risk for Levinson, Bordner and Strong — the Blue Scholars concert alone requires almost $8,000 in front money to pay the band, rent the concert venue and provide sound and security. But Bordner — who emphasized that he and his co-presenters have never made money from the concerts — said it was all worth it. Local teens and the Blue Scholars will perform on Sunday at 6:30 p.m. (doors open at 5:30 p.m.) at the Open Space for Arts & Community. Tickets, $15 for students with school ID and $25 for adults, are on sale at Vashon Island Music and from Harris Levinson at Vashon High School.